Carlesha Freeland-Gaither, the 22-year-old Philadelphia woman who was seen on surveillance video being violently abducted off the street, has thankfully been found alive. 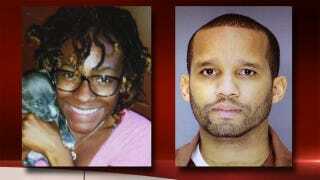 Using the GPS that had been placed in her abductor's car, federal officers tracked Freeland-Gaither to a parking lot in Jessup, Maryland, where she was found being held by 37-year-old Delvin Barnes in the back seat. After a brief confrontation in which Barnes attempted to flee, officers were able to rescue Carlesha. She was immediately taken to a hospital and she was reunited with her family. According to NBC Philadelphia, she suffers from minor physical injuries and has been "listed in good condition" with the expectation to recover." "[Finding Carlesha] is very special for all of us. You hope, you hope, you hope, but you don't really know until you're actually able to get her, and make sure she's OK. So it's very important that this has a happy ending," Philadelphia Police Commissioner Charles Ramsey told the press. Freeland-Gaither's attacker was previously being held on a warrant for the attempted murder of a teenage girl. He has been apprehended and now faces federal charges of kidnapping and assault. Freeland-Gaither is still in recovery and has not spoken to the press. Her mother Keisha Gaither spoke at a news conference on her behalf, saying "I'm taking my baby home. Thank you."